DESIIGNER ON HIS NO1 HIT PANDA! EMINEM & PROOF FREESTYLE - NEVER HEARD BEFORE! Legendary unheard throwback from 2000. DMX spitting the hardest freestyle! The legendary Lox talk about Top 5 DOA, having DMX back in Yonkers & new albums. Mos Def goin in with a legendary freestyle off the dome! Throwback to 1999. Sremm life! Rae Sremmurd goin in for 20 minutes straight with a legendary freestyle. Rae Sremmurd fire shots back at Ebro after claims they didn't wrote their own tracks. Lace up!! Machine Gun Kelly back on Tim Westwood TV with another crazy freestyle on Capital XTRA!! Can you count all the artists Kells mentions that inspired him? The Bay to London! G-Eazy goes in with another legendary freestyle! When Its Dark Out - December 4th! SNOOP DOGG'S FAVOURITE FREESTYLE OF ALL TIME! to the UK! Throwback to 1994 on Westwood's show. Post Malone talks working with Kanye West on new track Fade, Charlamagne interview. Will Smith The Fresh Prince & Jazzy Jeff drop an exclusive freestyle & mix for Westwood! Power's success, the sad passing of Chris Lighty & working on new album. 50 Cent says Meek Mill didn't expect Drake to come at him like that on Back 2 Back. 50 Cent on his success, the early years in the game & the current state of hip hop. Jay-Z goin in with a crazy freestlyle back in 1999! Mick Jenkins goin in with a crazy freestyle at the Crib Session! Drink more water. Method Man goin in real legendary back in 95! His greatest ever freestyle - unreleased! Diddy speaks to Westwod in 2000 about Sean Jean's $150 million deal, Bad Boy & Mase. Ja Rule speaking in 2004 about 50 Cent beef, Murder Inc, the FBI & music. 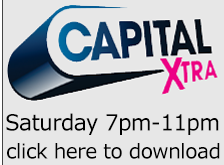 Listen again to Westwood shuttin it down on Capital Xtra with all the heavy hits & hottest bashment riddims! R. Kelly speaks to Westwood in Chicago in 2004 about music, his hometown and UK fans. Reppin South Africa - Cassper Nyovest goin in with a hot freestyle at the Crib Session! Cassper also addressed the beef with AKA, how it started and their current situation. Chip returns to Tim Westwood TV with another legendary freestyle! Westwood releases Skepta’s brand new mixtape with exclusive new tracks Top Boy & Good Times. Westwood speaks to Young Thug backstage after his crazy show in London about new music, labels, producers & swag! Oddisee goin in with a legendary freestyle at the Crib Session over Common's Invocation & Grand Puba's I Like It. Listen again to Saturday's show. New heat from Travis Scott, Rick Ross, Future, Tyga, Skepta. Plus a special 2Pac throwback. Dolla Sign! Ty Dolla on having no type, the baddest chicks, fake bootys, life of a playa & Paranoid actually happening to him in a club. #Swavey Toronto in the building! Tory Lanez goin in real legendary with a freestyle at the Crib Session. Check out all the legendary Westwood albums & mixtapes!